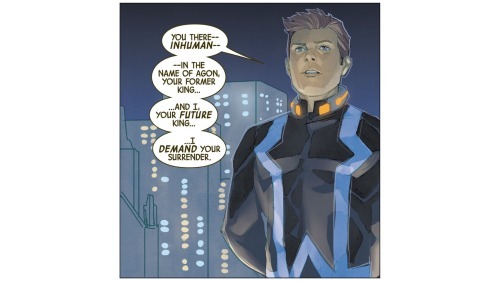 The plot thickens and the fact that Inhumans love swag is finally revealed in this penultimate installment of writer, Christopher Priest, and artist, Phil Noto’s terrific miniseries. The young Inhumans have fled to the human world, fearing a plot to destroy them that may or may not even be accurate. There they have made allies with Bentley Whitman, the human scientist who is secretly the super villain known as The Wizard; as well as a mysterious Alpha Primitive named Elisha whose intellect forces them to question the very tenets of Attilan’s culture and practices. Now Black Bolt, his brother, Maximus, and their cousin, Medusa, are preparing to return home to take down The Living Terrigen and reclaim the throne. 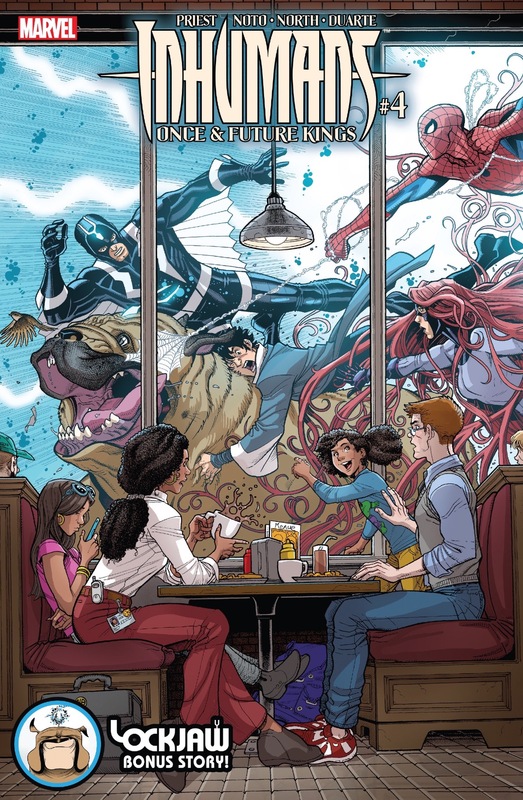 The last issue ended with Black Bolt having spotted The Amazing Spider-Man, mistakenly identifying the friendly neighborhood awl-crawler as a fellow Inhuman who might be recruited to their side int he upcoming battle against The Living Terrigen. Of course Spidey is not an Inhuman, nor is he one to take kindly to being ordered around by someone assuming to be his king. 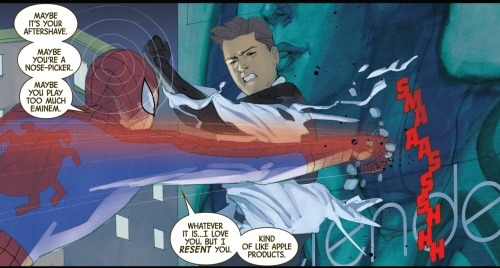 The encounter quickly devolves into a battle as Spidey is walloped by Black Bolt’s sonic powers (modified and controlled via one of Whitman’s inventions). Yet Spidey is much tougher than expected and he fights back, webbing Black Bolt to an adjacent building. Watching on from he street, Maximus intercedes, using his telepathic powers to try to force Spidey to surrender. And it is here that things get pretty weird. 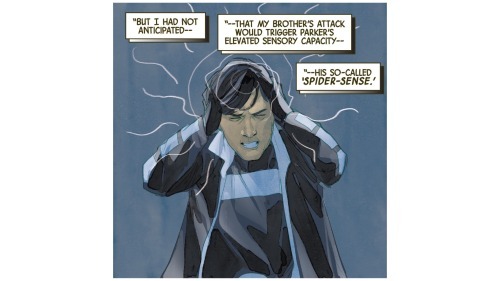 Maximus’s mental powers do not mix well with the preternatural awareness entailed in Spider-Man’s ‘spider-sense.’ They are two very different versions of psychic power and the interaction of the two creates a bizarre psychic feedback loop. Maximus’ mind is flooded with the thoughts and feelings of Spider-Man as is Spider-Man’s mind flooded with he thoughts and feelings of Maximus. The feedback is raw and overwhelming for both Spidey and Maximus and neither is able to handle the cognitive/emotional onslaught. Spidey is unable to handle Max’s ambivalent feelings of love and rage toward his brother and is taken by a jealous hatred toward Black Bolt… causing him to attack Black Bolt with a near delusional fury. Maximus, meanwhile, is similarly befuddled by all of the neurotic feelings of guilt and responsibility that he had gleaned from Spidey. It turns out that Spider-Man was in a bit of a hurry when Black Bolt had encountered him. His aunt is in desperate need of her medication and Spidey (or rather Peter Parker) needed to get photographs to his editors at the Daily Bugle in order to afford Aunt May’s medicine at the local pharmacy. Maximus comes to understand this and he is suddenly taken with the desperate need to get Aunt May her medicine. Spider-Man, meanwhile, fights with Black Bolt whilst voicing all of the mixed up and conflicted feelings that Maximus’ holds toward his brother. He loves his brother, but hates him as well. He feels that he should sit on the throne, that he is the one destined to rule Attilan. The fight between Spidey and Black Bolt is interrupted by the arrival of Kaldec The Seeker. The Seeker attacks, but is quickly defeated by the combined efforts of Spider-Man and Black Bolt. This interruption proves to be just what is needed in order for cooler heads to prevail. Black Bolt, Spidey and Maximus realize that they are not enemies. Furthermore, the importance of getting Aunt May her medicine takes precedence. All of this leads to an amusing scene where Maximus rushes into the pharmacy demanding the prescription for a patient first name ‘Aunt’ last name ‘May.’ I love this bit. Maximus and Medusa take a cab to Queens where Max delivers the medicine to Aunt May. Back in the cab, Maximus notices that he had lost his own medication and is beset by the worry that now his own madness will return. He is still processing through the feelings and values he had gleaned from Spidey, causing him to wax on about the sanctity of life, about what a kind and gentle soul this May Parker is; how much he had misjudged the nature of the humans of earth. He kisses Medusa in a fit of impulsivity. 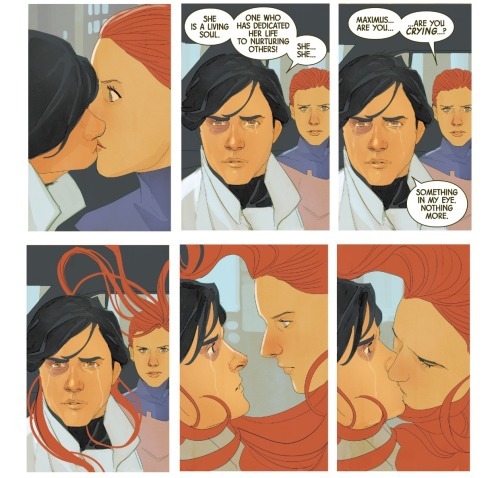 Medusa is initially taken aback by Max’s actions… yet after seeing this kinder, softer side of him her feelings seem to change and she kisses him back. wha!?! As all of this is occurring, the narrative switched back to Attilan where young Crystal meets the Stewardship King and his new Viceroy, Gorgon. With the aid of Lockjaw, Crystal is confident that she can go to the human world and convince her sister and the others to return home; and The Living Terrigen offers her his blessing promising that no harm will come to the runaway royals. Crystal and Lockjaw teleport back to the apartment of Bentley Whitman, where Crys discovers Elisha. She is surprised to find an Alpha who can speak and wears the clothes of a human. Elisha seems to know Crystal’s parents (might they have been the ones who taught him to read?). In any case, Elisha is able to convince Crystal that he is on her side, that he can lead her to her sister and then they can all return to Attilan together. 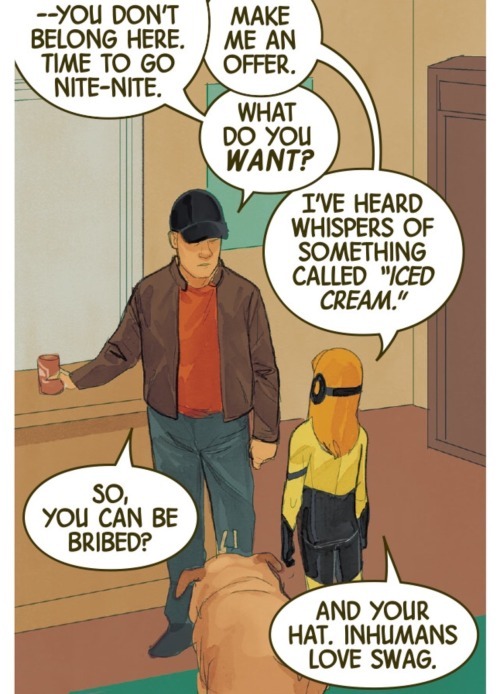 Of course doing this requires a bit of bribery as Crys insists on some ice-cream as well as Elisha’s baseball cap (because Inhumans love swag :3). A third storyline is also weaved throughout the narrative this one focusing on Triton and his brother, Karnak. Triton had been captured by a movie crew that had been filming some sort of see monster creature-feature (a story that was actually detailed way back in the pages of The Mighty Thor vol. 1 #’s 150-151). Triton had been offered up to some sort of research agency, studying him as though he were some mysterious alien species. The chemicals used to clean the tank where Triton is kept had befuddled his sense, but he has finally been able to clear his mind and manages to communicate with the researcher studying him. And in so doing manages to get her to let him go. 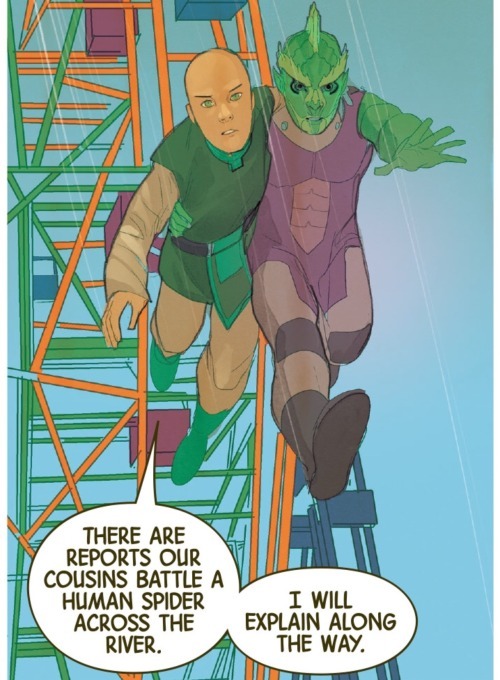 Soon there after, Triton locates his brother, Karnak, who has been searching for him; catching up with Karnak as he takes a ride not he ferris-wheel at Coney Island (okay?). In any case, Karnak and Triton are reunited and the two make haste to reunite with the others. And all of this is leading up to the final confrontation where each of these various plot lines, secrets and true motives will come together and be revealed in the last issue of the series. Just cant’s wait for that! There’s a whole lot to unpack here, not including the continuity weirdness where Black Bolt is apparently younger than Spider-Man. It remains to be seen whether or not The Living Terrigen is as benevolent a stewardship king as he claims or if he indeed has eyes to do away with Black Bolt and keep the throne for himself. Elisha’s fate is equally mysterious… will he be responsible for Attilan’s decision to do away with the Slave Engine? Maximus’ antipsychotic medication have been placebos all along; what does that reveal about the nature of his mental illness? And what’s all this with Medusa and Maximus making all kissy-face? The device of having Maximus and Spider-Man experience a mental feedback loop acts as a really cool means of depicting the intense and confusing ambivalence that Max feels toward his brother. 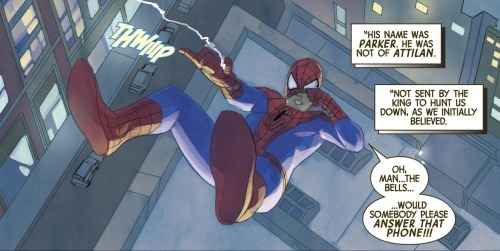 And the fact that Spidey’s dialogue was able to express this whist at the same time stay in tune with his knack for funny banter is really impressive. It’s seamless and funny, but also complex and poignant and a testament to Christopher Priest’s skills as a writer. The final issue is sure to be a bittersweet affair. I cannot wait to see what happens, to learn how all of this will resolve, but I’ll also be quite saddened to see this series come to an end in that it has been such an absolute joy to read. And, as always, Phil Not’s illustration is second to none. 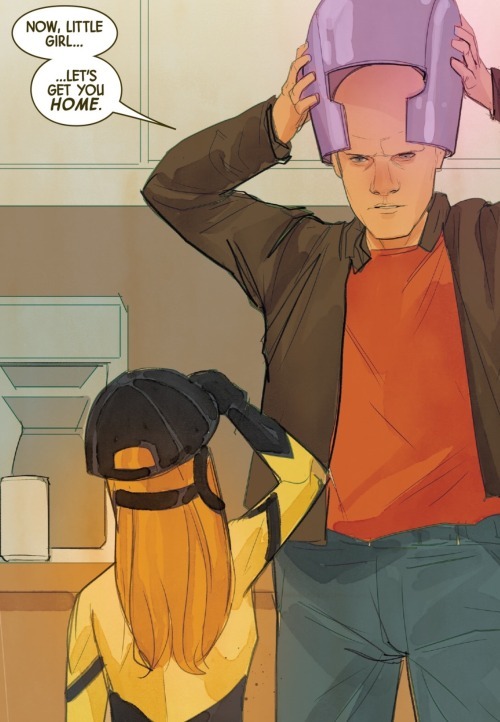 I’ve always loved the way in which Mr. Noto draws figures and faces, yet in this series what has truly impressed me has been his deft skill for action, panel composition and backgrounds. The battle between Spidey and Black Bolt was just terrifically dynamic, cinematic; and the quieter scene between Max and Medusa was equally intense, but n a softer, more romantic fashion. I’m pretty much out of adjectives to laud Mr. Noto’s work. It’s just so good! He could illustrate the phonebook and I’d eagerly lap up each page! A quick thought on Maximus’ taking placebo medication before ending this review. Placebos are actually rather commonly utilized in psychiatry. A patient’s expectations and beliefs about a given medicine can be sometimes be just as powerful as any actual pharmaceutical agent. Of course doctors would never prescribe placebos for severe conditions, but products like St. John’s Wart or Ginkgo Biloba (which have no discernible medicinal values) have nonetheless often succeeded in proving highly effective in countless clinical situations. That said, offering a placebo for psychosis is just unheard of. And this suggests that Maximus’ doctor may not believe that Max truly suffers from schizophrenia. Perhaps Maximus’ ‘madness’ is merely a product of his imagination, a means of coping with his terrible feelings of guilt over his role in the accident that caused his parents’ deaths. To this extent, the doctor prescribed Max the placebos in the hope that Max’s mere belief that the medication would curb his madness would in and of itself prove effective. Fascinating. Another great and definitely recommended installment. I wish this series was never to come to an end! Four out of Five Lockjaws.